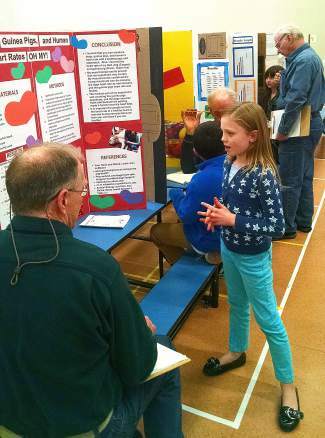 Gianna Damato talks about her science fair project during the event on Feb. 10. 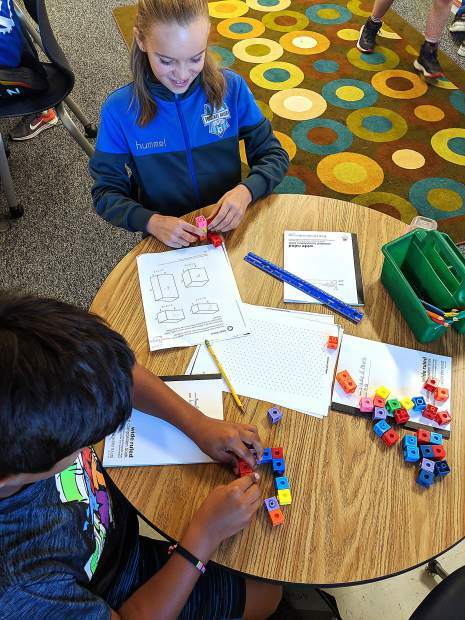 INCLINE VILLAGE, Nev. — On Feb. 10, a talented group of student scientists entered their projects and inventions into the annual science fair competition held at Incline Elementary School. Student and class science fair presentations filled the multipurpose room, with more than 120 projects on display. At the awards presentation on the evening of the 10th, student scientists were on hand to explain their projects and answer questions as parents and members of the community viewed the event. Congratulations to the more than 300 students who participated in the science fair, either individually or as part of a classroom project. Classroom Projects: Eric Harssema (Third Grade) and Michelle Mintz (First Grade). Students who were recognized for their strong Science Fair entries include: Lainey Lowden, Dawson Ferrell, Liam Ellis, Whitney Kiesel, Sarah Lockard, Cameron Fischer, Emma Stickney, Katie Fuller, Christelle Rosas-Caro, Marisol Guillen, Emma Midgley, Brianna Kurashewich, Jamie Perez Rojas and Shannon Hugar. A big thank you to all of our amazing judges, who worked hard all day interviewing every student, and then faced the difficult task of choosing winners. IES 2015 Judges: Diana Hitchen, Carly O’Connell, John Gregory, Mark Helt, Khal Pluckhan, Richard Caviness, Dennis Medeiros, Leo Craft, Brenda Kiesel, Aaron Daniels, Gary Thomsen, Brent Welling, Mark Smith and Chris Finne. The Incline Elementary Science Fair is a partnership between the local AmeriCorps chapter and the PTA’s funding of the science program. This is the final year of the local AmeriCorps program, so extra support will be needed to continue this wonderful event for our local students in years to come. To find out how you can help support science education and the Science Fair at Incline Elementary, please email: IEScienceLab@gmail.com. Maria Pittner, an AmeriCorps member, is the Science and Outdoor Education Coordinator at Incline Elementary School.